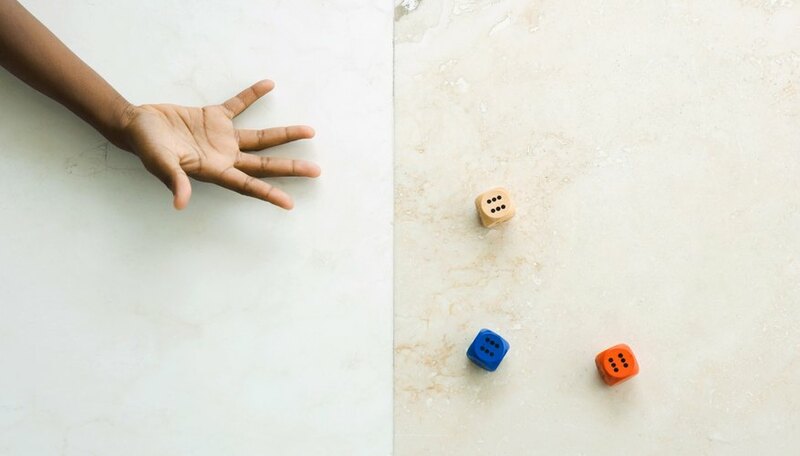 Left Right Center, better known as Left Center Right, is a dice game for all ages that is easy to learn and simple to play. This game of chance doesn't require any strategic skills, giving beginners the same chances of winning as experienced players. This makes LRC a good game for younger kids who don’t like losing -- nobody is out of the game until someone wins, and when that happens, everyone else loses at the same time. Playing can help children learn how to tell left from right while having fun. To play LRC, you need three special dice and some play tokens. Each die in LRC has a single large dot apiece on three of its sides; the other sides are marked with an L, an R and a C. You need at least three people to play, but there is no upper limit on number -- although adding too many players can dramatically increase the game's play time. As long as you have one set of game dice and enough tokens to give three to each player, you're good to go. Put the dice in the middle of the table and give each player his or her tokens. Decide who will throw the dice first and whether gameplay will pass clockwise or counterclockwise. When it is your turn, roll your die or dice and distribute your tokens as follows. If you roll an L or an R, pass a token to the player sitting to your left or right, respectively. If you roll a C, put a token in the "pot" in the middle of the table. If you roll a dot, keep a token. On the first turn, each player will roll all three game dice. After this round, a player may only roll all three dice if he or she has three or more tokens. If a player has one or two tokens, he or she only rolls one or two dice, respectively. If a player has no tokens, he or she skips his or her turns until another player's roll gives him or her a token or tokens again. Play continues until only one player has any tokens left -- he or she wins the game and takes the pot. Most LRC games come with dice and a pack of tokens. If you don't have tokens, you can use poker chips or counters. If you don't have LRC dice, use regular six-sided dice and decide which numbers substitute for the letters and the dots. If younger kids find it tricky to remember this, you can stick paper on the sides of the dice and write the letters and dots on them. Be forewarned that if you have a lot of players, a game can last a long time. To shorten it, decide ahead of time that players who lose all their tokens must leave the table. Some variants of LRC bring a special rule into play when a player rolls three dots in one turn -- if this happens, that player takes all the tokens in the pot. And regardless of whether you're houseruling your game, you can spice up LRC by playing with cash rather than tokens or by giving the winner a table prize. Or if you're playing as a family, you can use candy or treats for tokens. But be aware that an edible pot may diminish before the end of the game if players can't resist dipping into it on the sly.